If you want to destroy the British car industry, I can’t think of a better way! These are simply floated rumours, intended to keep activist desires at the front of the press. Why are you giving them credence by repeating them? If you must, at least provide the reasons why this is an ill thought-out suggestion. There are many such…. Not for the first time we see our MP’s seriously getting in the way of things. Their rush to outlaw ICE’s is absurd when there’s NO replacement system available. They also appear to have stupidly gone full-on for zero emissions when it’s obvious hybrids are an excellent (and viable) stepping stone that fits with our existing power capacity. We do not have a viable alternative at present. We did exactly the same over coal fired power stations, by shutting them down before a viable and reliable alternative. Once again the poor bloody foot soldiers pay the price of posturing EU and Westminster politicians. Why are our MPs so stupid? Electric vehicles are nowhere near being a practical alternative to petrol and diesel, and could even be more injurious to the environment due to the difficulty in disposing of their large batteries when they frequently come to the end of their life, together with the negative effect on the environment through the need to produce huge amounts of additional electric power to recharge the power-hungry batteries which are needed to keep the millions of vehicles across the country on the roads. In addition, there is no absolute proof that petrol and diesel fumes, with which the population has been living for 80 or more years without effect on our health is a problem. It is another of those ‘might be’ problems that is so far unproven Children are growing taller than they were yesteryear; the population is growing to an older age, so what then is the problem? I just wish our MPs would think it through occasionally and not automatically try to be seen to be good environmentalists by making silly statements just to suit their image. Our MPs appear to be totally illiterate, especially when it comes to transport. Mind you I doubt whether our MPs and upwards will dump their cars, just the peasantry and virtue signallers! The loonies took over the asylum formerly known as UK government way back in 1973, now generation eco snowflake are assuming the reins and no matter how high the British consumer/ electorate are told to jump, it’s never high enough and always further and further and nearing the edge of the cliff, where a deindustrialized cold hell awaits. Everytime you put a cross next to liblavtory, you assent to it. This is clearly going to be one of the bidding wars in coming general elections, my vote will go to whichever one that says that banning anything will be banned. BBC fake news again, and they are really ramping it up prior the annual bean feast for the hypocritical green alarmists. I’ve always said if the idiots pushing EV’s should actually use them, and I mean use them and personally dispense with their ICE vehicles, they would soon realise EV’s are not a viable solution. Interesting, Bloomberg, of all people, said the other day EV’s create more CO2 than petrol or diesel over a ten year period that ICE’s, and I bet they didn’t build in the need that EV batteries over ten years would have to be replaced. . This is so frustrating and annoying. It really begs the question – what are our politicians really for? If they can be so gullible on this subject, what about other issues e.g. the “cost of living crisis”, the “health service crisis” and so on? Every time I ask how our Senators and Congresscritters could be so stupid I remember that we voted them in. I hope the UK doesn’t really implement that no petrol suicide pact, because we keep voting in folks who think it’s really cool to be just like the UK and EU. For the time being we have enough supply and people to keep the petroleum economy going. But never underestimate the power of human stupidity (R. A. Heinlein). This is so much all for nothing ! CO2 has not been proved to be the Cause of alleged Global Warming, – as from core samples taken, temperatures have shown historically to rise BEFORE atmospheric CO2 increases, and not AFTER CO2 increases, – CO2 cannot therefore be a CAUSE of global warming!! At CO2’s 0.04% concentration in the atmosphere, how can such a trace gas whose actual molecules would be hard to find, – possibly be a greenhouse gas to the extent of dangerously raising temperatures? Has Claire Perry got an electric car? Not as far as I know. And I don’t think there are any ministerial electric cars either. Good article in ‘notrickszone’ from a German news report that mining for EV battery materials is the making of environmental disasters in number of countries. Of course you won’t hear about that on the fake news media, BBC..
Quite daft! 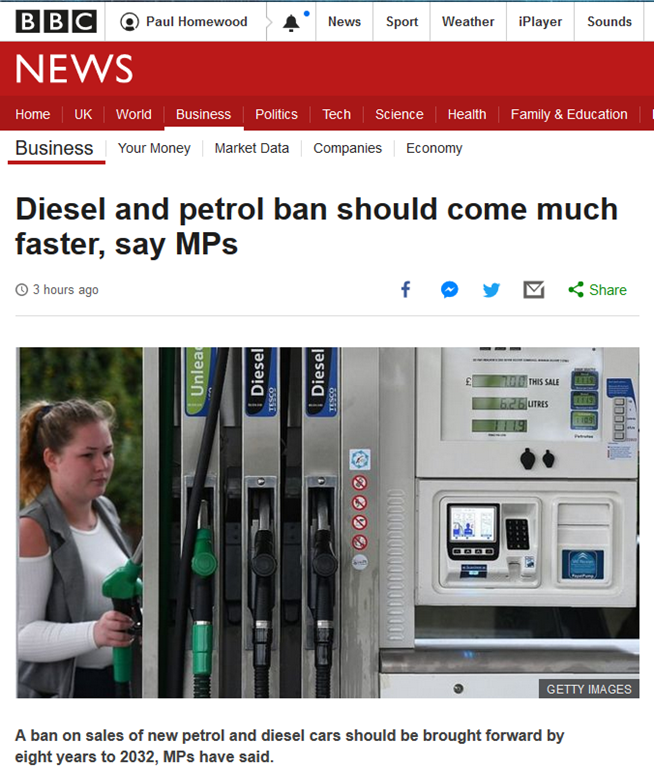 As I see it, having heard Perry banging on about it again on R4, it seems that the plan is – once the clean technology of petrol and diesel engines reaches its cleanest and most efficient – to ban the sale of them – as NEW cars. That means, afaics, that the roads will be dominated by old clunkers, especially where people need the efficiency, affordability and usability that EVs cannot give. My nephew told me that his neighbour drives nearly 30,000 miles a year for his work and was asked if he’d like a Tesla….! He settled for the new Audi Q8. I can imagine a roaring trade for second hand cars. A bit like Trigger’s broom. He’s not had a new broom for umpteen years, but it’s had 17 new handles and 12 new brushes!! Presumably there will be an exemption for working vehicles (there has to be for HGVs etc and down to flat beds, it all depends where you draw the line). Leaving aside the fact that these monstrous diesels are probably much more a part of the “problem” than small cars, where exactly will that line be drawn? Jaguar Land Rover have made a fuss about brexit but not the electric vehicle mandate. (Maybe I missed it.) Why? Because the latter is a hypothetical? Or because they think their new shiny Defender will never be compelled to run on a battery…? Do they slyly think that everyone who can afford one will be flocking to a car that is still allowed to have an ICE? If it was the fashion industry heads would roll. The BBC blog on this allows comments😲😲 Best be moderate and stick to facts. This policy will end in civil unrest. We the population up with it will not put. Once,of course we all wake up. Also on notrickszone I think, ADAC, the German motoring organisation worked out that an electric car has to be driven for 585,000 km before it breaks even on co2 with a diesel car. And how many electric car owners are ever going to do that sort of mileage, pretty well none I would think. of ccourse an MP could vote for this, they’re high earners at £77K, and they’d just put the elecc car cost into their expenses. The median income is £21k…..
Why do they think that electric vehicles will be zero emissions as they will all be fuelled by fossil fuel genertated electricity. It is the only source of electricity that can respond to a load increase (excepting hydro but it’s negligible). Therefore I don’t see any CO2 decrease by using electric vehicles, and may even increase it? Perhaps MPs have some strange wish to experience lynching?